Brexit deal flops, Theresa May survives - so what happens now? After Theresa May's humiliating defeat, what's next for Britain and Europe? Prime Minister Theresa May’s Brexit deal has been thrown out by Parliament. She’s now in talks with rival politicians to find a way forward before presenting a Plan B on Monday. If her plan isn’t convincing, then British lawmakers will try to take over the process. That could mean keeping much closer ties to the bloc, or even a second referendum. With just 10 weeks to go until the U.K. is due to leave the European Union, what are the most likely scenarios? Keeping close ties to the EU’s single market and customs regime might be the best way of getting a Brexit deal that Parliament can support, though May has ruled it out. It’s known as “Norway-Plus” or “Common Market 2.0” to its supporters and “Brexit in Name Only” to its detractors. Critics have a point: this scenario would leave the U.K. taking rules from Brussels and wouldn’t address one of the main pledges of the referendum campaign -- that uncontrolled immigration from Europe would stop. Businesses would mostly be pleased. To get there, members of Parliament propose motions or amendments that show there’s support for the idea. The government asks for an extension to the Brexit day deadline of March 29 and reopens talks with the EU. The Withdrawal Agreement remains unchanged, including the much-loathed Irish border backstop. But the declaration on future ties is rewritten, making it very unlikely the fallback option will ever be used. ALSO READ: Brexit deal flops, Theresa May survives - so what happens now? The plan then needs to get through the House of Commons. May might lose a couple of pro-Brexit ministers along the way, while the governing Conservative Party would be more divided than ever. Britain could then leave in late 2019 or 2020 and most people wouldn’t notice anything different. May has long promised not to sign up to a customs union as it would prevent the U.K. from striking new trade deals with other countries, another key pledge in the 2016 campaign. She reiterated that stance in private to Brexit hardliners on Thursday. She’d risk euroskeptic ministers resigning and would lose some support from her party too. But it might just be enough to win over those pro-EU Conservatives -- and some Labour MPs -- who would see it as close enough to the party’s official policy as to be acceptable. This one also comes with an extension of the negotiating period, so Brexit won’t happen on March 29. And the Irish border issue won’t be completely fixed just by staying in the customs union. There’s a risk pro-Brexit Conservatives and the Northern Irish Democratic Unionist Party could be so outraged that they oust May’s government by lending their support to Corbyn’s next no-confidence vote. Several paths lead to this one. Labour wins a no-confidence vote with the help of angry Brexit supporters and an election is triggered. Alternatively, May could call an election as the only way to get a mandate for her deal. Still, it might not change the parliamentary arithmetic much. So the impasse remains unresolved. If Labour repeatedly fails to get the general election Corbyn is clamoring for, he said the next option is to consider backing a second referendum. His party’s members voted at their conference last year that one should be on the table, so if Corbyn backs a re-run, there’s a fair chance it will happen. About 10 Conservatives have already come out in favor of going back to the people, as have the smaller opposition parties. It emerged on Thursday the government has researched the logistics of a second referendum. The main takeaway is that it would take more than a year to arrange -- another reason Brexit might not happen on time. 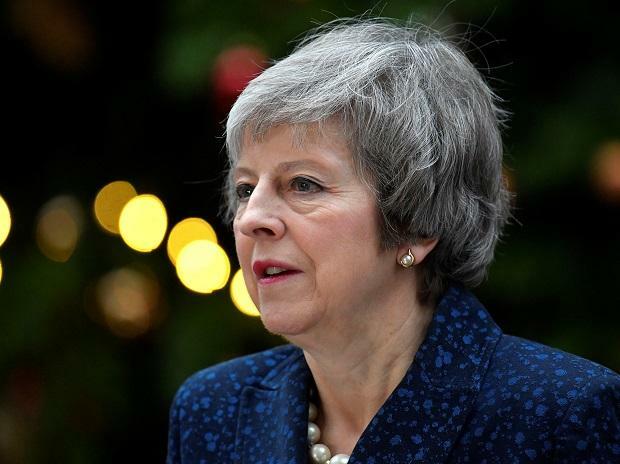 European officials are already working on the assumption that the U.K. will ask for an extension to the Brexit deadline. It’s not clear for how long. Neither side wants perpetual negotiating limbo, but neither can the option be ruled out. This is the default option and it’s also the one both sides want to avoid. The U.K. Parliament is overwhelmingly against it and has tools to block it. Britain can also unilaterally reverse Brexit, according to a court ruling last month -- another safety net. But May doggedly refuses to rule out no deal, and so businesses still have to prepare for the worst.